It’s December. Although I see the words on the computer screen, I am in absolute disbelief. It feels like yesterday that we were discussing our 2018 goals and vision for WebRevelation during our January staff meetings. Now, as we sit here on a cold winter day in December, we find ourselves thinking back on how much WebRevelation has grown over the last 14 years. Not only that, but we also can’t help reminisce on how we have been an integral part in helping numerous businesses with their own growth and development. It’s clients of ours such as Gellco, where we utilized our knowledge and expertise to solve their online problems. Based in Oklahoma, Gellco is an outdoor clothing and footwear supplier for the manufacturing and oil and gas industries, as well as construction businesses. Gellco provides these businesses with durable apparel sold all throughout the United States via the internet. Imagine the headache of contract pricing, handling mass quantities of products, and tracking employee spending with each client organization... all on an antiquated spreadsheet. As you can imagine, it was a tedious process. Gellco also lacked a dynamic website, often leaving businesses frustrated and confused during their attempt at online ordering. This is where WebRevelation stepped in. We were able to meet with Gellco to further understand their challenges, which allowed us to create a new, modern e-commerce website capable of handling all aspects of Gellco’s business. Old-fashioned spreadsheets were removed and replaced with an online application. Business intelligence functionality was added to help with sales and marketing, virtual wallets started tracking individual employee spending, and an upgraded system now allows Gellco to set individual pricing for each client. Where they once struggled to keep up with customer demand, Gellco is now thriving in both handling orders and with client retention. We’re proud to work with Gellco and many other companies to make their business run smoothly because it’s clear that custom application development can save time and effort for employees, customers and business owners alike. Do you have an e-commerce business that could use our help? Are you ending 2018 feeling like your company website needs a new look and feel? Do you have a need to streamline processes with an intelligent application system? 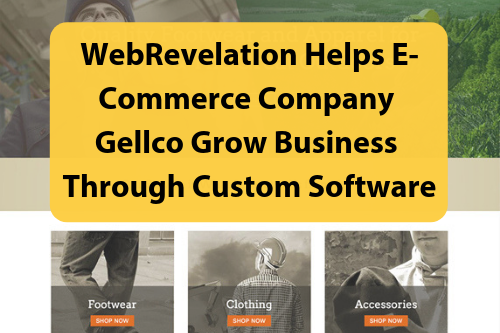 We helped Gellco with numerous aspects of their online business and we can help your company thrive as well. Connect with us to take your business to the next level in 2019.